Xilisoft MP3 WAV Converter is an exclusive MP3 and WAV encoder that can convert MP4, M4A, MP2, WAV, MP3, WMA, OGG, AAC, FLAC, APE, VQF, etc. to the most popular audio formats MP3, WAV and MP2. The software is also able to extract audio tracks from video formats like AVI, MPEG, WMV and ASF and save them as MP3, MP2 or WAV format. Supports copy ID3 tag between formats so that you can easily transfer all of the most useful tag fields from one format to another. It supports batch conversion. The output quality is adjustable. When converting to MP3, bitrate, VBR or CBR, stereo or mono are selectable; and when converting to WAV, sample rate, stereo or mono and compression method are selectable. Users are able to edit the output path or use the same one as the input path. 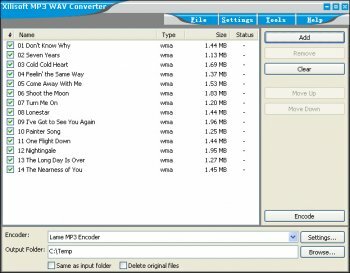 Xilisoft MP3 WAV Converter allows users to select whether delete the original files.